I have tried numerous sources to find a way to establish my own format for text in Pages, TextEdit, Reminders, Notes, and Mail. In each application I am able to set a style including a color but on opening a new document the style has not maintained the color. Is there a way to create a style that maintains colors for new documents? I’ll address this on an application-by-application basis. Pages: This is easily done. Launch Pages, create a new document on your Mac, and choose the font, text, text size, and color you wish to use. From the File menu choose Save as Template. Name your template and save it to the default location (the My Templates folder). When you wish to use this “style” just choose File > New From Template Chooser and in that template chooser click on My Templates and then open your custom-colored template. TextEdit: TextEdit doesn’t let you save documents as a template, but you can create a style that includes color. 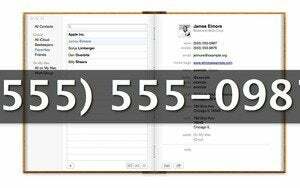 To do that ensure that all new documents will be in the Rich Text format. (Open TextEdit’s preferences and enable the Rich Text option in the New Document tab.) Create a new document and configure the Font, Style, Size, and Color toolbar controls as you like. 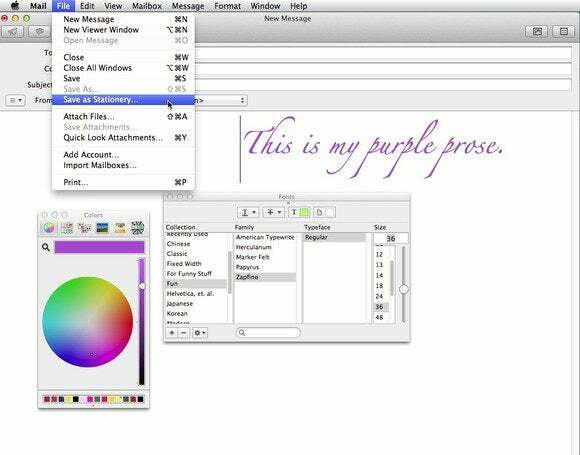 TextEdit allows you to save colored text as a style. From the Styles pop-up menu at the top-left of the window choose Show Styles. A sheet will appear and reflect the document’s current settings. Click the Add to Favorites button in this sheet. In the resulting sheet name the style, enable the Include The Font As Part Of The Style option, and click Add. It will be added to the list of styles in the toolbar’s Styles pop-up menu. When you next create a TextEdit document and want to use this style, just choose it from the menu. Reminders: You’re out of luck with Reminders. You can’t create a style or template nor will Reminders allow you to use other fonts or colors. Notes: By choosing Format > Font > Show Fonts you can change a note's text, size, and color. But you can’t save these settings as a style. Mail: Mail doesn’t have styles, but it does have stationery, and that’s your avenue to creating messages that include the font, text size, and color you prefer. Follow along. Create a new message. Press the Spacebar to create an empty character space and then highlight that space. Choose Format > Show Fonts. Choose a font that you’d like to use from the Fonts window. If you normally create messages in plain text you’ll be asked if you’d like to convert the current message to rich text. Click the Convert button to agree to this. Now configure your text, size, and color settings. When you finish, choose File > Save as Stationery and in the sheet that appears, name your stationery. When you next wish to use the “style” you’ve created, create a new message, click the Stationery button at the top-right corner of the message window, and from the Custom stationery heading, choose your stationery. When you type you’ll find that your prose is as purple as you’ve wished to make it.